Secretary of State John Kerry evidently runs a tight ship, given the paucity of leaks that emerge from his office. So we know he is organized and disciplined. He is also an energetic risk-taker, jumping into high-wire negotiations with Iran, and forcing the Israelis and Palestinians to the negotiating table -- enterprises that could likely end in failure and ruin his reputation. This is a man with character. By contrast, his predecessor at State, Hillary Clinton, appeared to take few risks and has been accused of using the position of secretary of state merely to burnish her resume in preparation for a presidential run. But there is one thing that Kerry has not been good at: explaining what he is doing and why to the public. How do these high-wire negotiations fit into a larger strategic plan? What do the Iran talks have to do with those between Israel and Palestine? What is the relationship between the two sets of Middle East negotiations and American strategy in Asia and Europe? The Obama administration has provided the public with little insight on any of these matters. Why can't the administration explain better what it is doing? I believe the reason is that the administration cannot own up to the philosophical implications of the very policy direction it has chosen. It is as though top officials are embarrassed by their own choices. The administration has refused to intervene in Syria in a pivotal way, and it has very awkwardly still not managed to make its peace with Egypt's new military dictatorship -- though it does not oppose the new regime in Cairo outright. But it is embarrassed that it has done these things. The Obama team wants to pursue a foreign policy of liberal internationalism, in the tradition of previous Democratic administrations. It wants to topple a murderous dictatorship in Syria. It wants democracy in Egypt. But instead, it finds itself pursuing a foreign policy of conservative realism, in the tradition of previous Republican administrations, like those of Dwight Eisenhower, Richard Nixon and George H.W. Bush. It is doing so because realism is about dealing with the facts as they exist on the ground with the goal of preserving American power, whereas liberal internationalism is about taking risks with the facts on the ground in order to seek a better world. President Barack Obama and Secretary Kerry are afraid that if they intervene militarily in Syria they will help bring to power a jihadist-trending regime there -- or conversely, Syria will disintegrate into even worse anarchy, with echoes of Afghanistan in the 1990s. So they do little. Obama and Kerry must know that the choice in Egypt is not simply between dictatorship and democracy, but between military authoritarianism that can be indirectly helpful to Western interests and an Islamist regime that would be hostile to Western interests. So they quietly, albeit angrily, accept the new order in Cairo. The administration knows that if it wants to pivot toward the Pacific, it must also attempt to put America's diplomatic house in order in the Middle East: thus, it seeks a rapprochement with Iran and a deal between the Israelis and Palestinians. All of this is reasonable, if uninspiring. But the Obama team has been relatively tongue-tied because it cannot admit to being a liberal Democratic administration pursuing a moderate Republican foreign policy. It is a shame because publicly explaining some of these actions should be relatively easy. In regards to Egypt, all the administration needs to say is, We support democracy where we can and stability where we must. In regards to Syria, it can warn about the unpredictable dangers that come with serious military intervention. It can explain Iran and Israel-Palestine in terms of America's larger goals in the Middle East and Asia. The more peace there is in the Middle East, the more that America can concentrate on Asia -- the geographic center of the world economy. Though Hillary Clinton was risk averse, unlike Kerry, she did explain what she was doing. Her "pivot" to Asia may have been sniped at by some experts and pundits. But it was a strategic conception that was somewhat original, and she did, in fact, explain it better than Kerry has explained anything. In fact, she authored a long essay about the Asia pivot in the magazine Foreign Policy. That was rare, since original ideas ordinarily do not come out of government. Obama has good realistic instincts, but thus far he doesn't have a strategy that he has been able to explain to the public. And without a strategy he loses influence, since power in the media age is not only about deeds and capabilities, but about what you rhetorically stand for. Ronald Reagan was a powerful president in significant part because of his soaring rhetoric. (After Russian President Vladimir Putin annexed Crimea, Reagan would have flown to Poland or the Baltic states and declared, "Mr. Putin, I am standing on hallowed NATO ground!") George W. Bush was a weaker president than he might have been because he was perceived to be inarticulate. Obama is a fine speaker, but he has explained little in the foreign policy realm, and even when he does so he appears to lack passion, as if he is merely reading his lines. This makes his foreign policy weaker, regardless of the inherent strengths of it. And it makes his opponents overseas have less respect for him. Once again, in a media age, presentation and branding can be 50 percent of everything -- especially if one is on the world stage. If this were not the case, political leaders in both democracies and dictatorships would never give speeches, but would confine their activities strictly to behind-the-scenes meetings. Obama certainly has material with which to work. Just look at the world today. China and Russia, with all of their problems and limitations, have emerged as major geopolitical rivals of the United States in their respective regions. The Middle East is fundamentally more unstable than it has been in decades, with several state collapses having provided fertile breeding grounds for the most extremist groups. Of course, the United States cannot dominate the world. It cannot kick China out of Asia and Russia out of Europe. And it cannot fix societies like Syria and Libya. But it can intelligently maneuver, affecting power balances everywhere more often than not to its advantage. And one of the ways it can do this is by -- to repeat -- supporting democracy where we can and stability where we must. It can also do this by preserving a measure of global stability through air and sea deployments in the Pacific and Indian oceans. The United States can be the organizing principle for working with Europe against a revanchist Russia. All of these parts fit together. This and much more can be explained to the American people. And doing so would certainly enhance U.S. power, making it less likely to be tested in the first place. Robert D. Kaplan is Chief Geopolitical Analyst at Stratfor, a geopolitical intelligence firm, and author of Asia's Cauldron: The South China Sea and the End of a Stable Pacific. 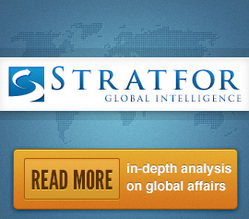 Reprinted with the permission of Stratfor.